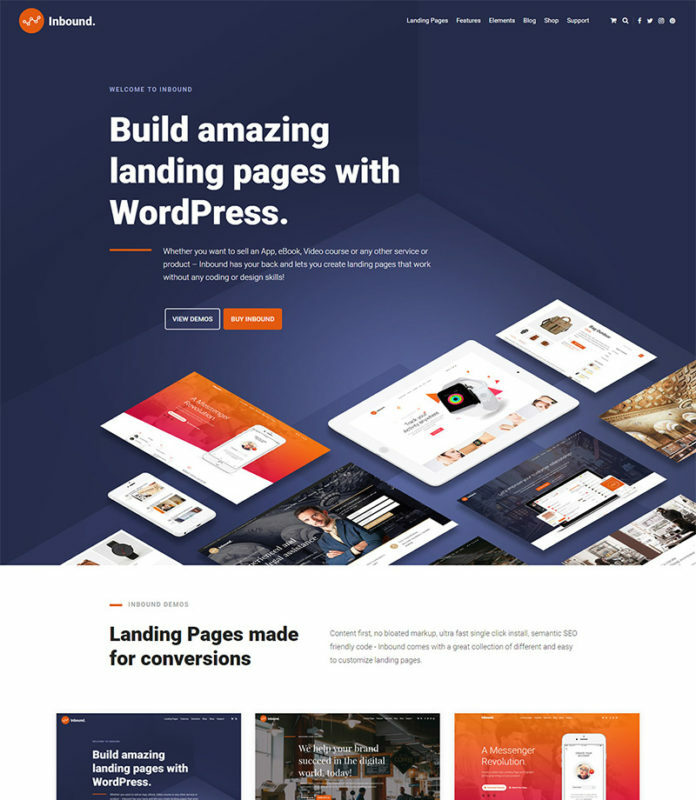 Create amazing landing pages in WordPress visually! Whether you want to sell an App, eBook, Video course or any other service or product – Inbound has your back and lets you create landing pages that work without any coding or design skills! View Demo Buy for$49.00 Pre-Sales question? Ask us! Wether you are an expert or just a beginner, creating your next website with Inbound is easy! Inbound is fully responsive. With crystal clear graphics and typography, your site looks stunning on any device. Create all your pages visually. Inbound seamlessly integrates with an intuitive drag and drop page builder. Design an unlimited amount of unique pages with banners and widgets - with just one installation of the theme. There is virtually nothing you cannot customize in Inbound Shelf: layout, typography, colors and banners. Off the Shelf was build with SEO best practices in mind: semantic, well-structured code and a small footprint. In Off the Shelf, you can pick from a variety of demo templates to use as a starting point. And we keep adding more! Unlimited Projects, create and test different websites, landing pages and designs, with only one installation! Drag and Drop page builder, No need to code. Focus on what matters and create entire websites with our easy drag and drop page builder. Unlimited Color and Layout options, unlimited rows and columns, boxed or wide layout, any color you want. Make your page unique and stand out from the crowd. 100% Responsive – Inbound adapts beautifuly to any screen size. Wether mobile, tablet or desktop pc, your website looks great. Various Header Styles - Make your header transparent, choose any color, with toolbar, sticky or not. You have multiple header options! Cross Browser Compatibility - No matter which browser your customers will use, Inbound looks good in any of them! Parallax backgrounds - Like the parallax effect? Include this versatile effect on any row you create as often as you like! All Demos included - Great looking and powerful templates that save you time are included and we are constantly adding more! 5 second Demo install - You want your site to look like a certain demo? Choose the Demo you want and install it with one click. It's as easy as that! Very easy to install – Wether you are an expert or just a beginner, creating your next website with Off the Shelf is easy! Completely widgetized – The theme comes with 30 custom widgets, including call to action elements, icons, pricing tables and much more! Complete WordPress theme - Off the Shelf is a full featured WordPress theme, that takes advantage of all the great things WordPress has to offer! Advanced Customization Options – Integrate your own code or CSS and change Off the Shelf to anything you can imagine. Duplicate complete Websites – Speed up your working process and duplicate complete websites, banners or single pages! Post Formats – Standard, Image, Video, Gallery or Quote. Off the Shelf supports WordPress custom post formats! Powerful Admin Panel - Lightweight and intuitive admin panel that integrates seamlessly with WordPress, giving you complete control over your project! Gravity Forms - Works with Gravity Forms - integrate the most popular solution for forms in WordPress. Automatic theme updates - Always receive the latest version with our integrated theme updater. Fast and easy. Video Tutorials - We release fresh tutorials how to do new amazing stuff on our YouTube Channel! Inbound is very compact - every function is in the right place. The theme has the shortest learning curve for a theme I have ever experienced. The design is awesome - the additional landing pages and templates are simply the cream on the top. Create as many websites as you want! Each profile contains a complete set of theme options, including colour and typography settings, that can be assigend to individual pages or parts of your site. That way you can make parts of your site, or just an individual page, look different from the rest. You can create as many profiles as you need and you have the option to export, import or duplicate each of your profiles. No need to code, create your websites visually! reate your website visually without any limitations. No coding is required, with an intuitive interface you can create your next project with a couple of clicks and with over 30 custom Inbound Shelf Widgets we make sure you have the building blocks to do so. Create the Website you want in a few seconds! At installation, you can choose a demo layout that you like and install it with a single click. There is that one demo page that really sold you on the theme? Go ahead and make yours look identical in seconds, without cluttering your site with useless demo content that you will end up deleting anyway. Install only what you really need and want and get started with your content. Wether you want to optimize your Site with YOAST Seo, include MailChimp or speed it up with W3C Total Cache. Inbound has your back! and create a great website! No costly update subscriptions — you pay only once and get free updates for the support lifetime of the product. 6 months of technical support are included, even for our smallest templates. If there is anything you need assistance with, please contact customer service. All our themes come with documentation and inline section comments to help you get started with your customization.